late forties and early fifties. 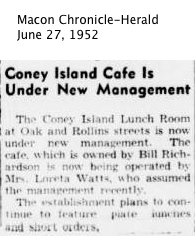 The Macon Chronicle-Herald of April 8, 1949 has the following entry, "Coney Island Cafe under new management. 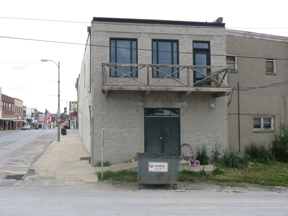 We have just purchased the Coney Island Cafe and will appreciate patronage both old and new. Mr. and Mrs. T.A Stasey." They later operated the "Rainbow Cafe" a few blocks away in Macon, and another cafe in Atlanta, Missouri. Here is another notice in the paper on June 27, 1952. 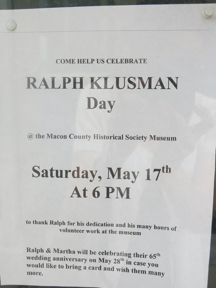 We found a poster on a downtown street advertising Ralph Klusman Day, the same Ralph Klusman we’d just met in Ten Mile. He was celebrating his 65th Anniversary on the following day, May 28, the day of our anniversary as well. 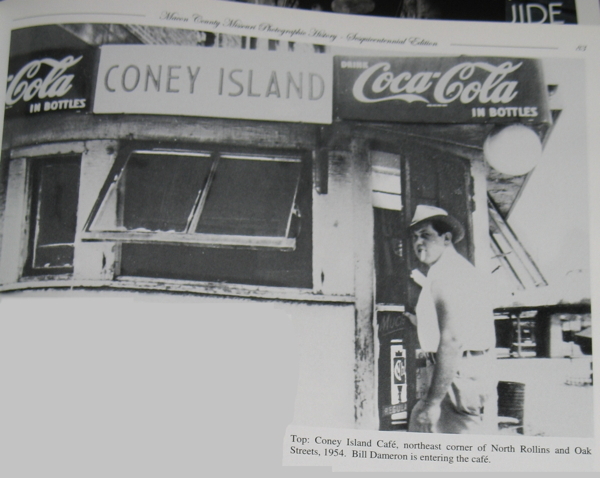 This is a picture of Bill Dameron entering the Coney Island Cafe in 1954. It is scanned from a book of pictures compiled by a long time photographer and jeweler in Macon. 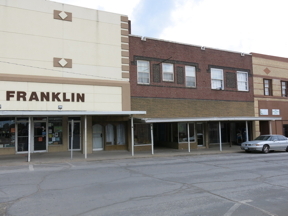 We took pictures of the front of the building where the Staseys had an apartment on Rollins Street, went to the courthouse and took pictures of the war memorials before driving around town.In the picture at right, the Stasey's apartment was on the second story of the red brick building, the three left-most windows. 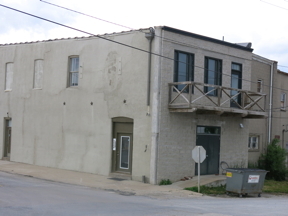 The entire second floor had been rebuilt into offices during our visit in 1995. Finally, we drove back to Hannibal, through a blinding rainstorm and finished the day at the Golden Corral.